Today I’m talking about a meal planning service that is an amazing help in planning my day, so I thought you might be interested also. To make healthy meals as a young mother, I committed myself to the time it took to follow recipes and plan meals every day. Nowadays, life is different because it is only John and me at home. I lost my motivation to plan meals every day. In fact, I dread it. I usually put off planning dinner to the last minute and throw something together with items we have in our home. meals is overwhelming to me. I know many of you are terrific cooks and can go to the grocery store and “wing it” and come home with a full week of healthy meals. You might even be able to come up with some yummy dinners at the last minute, and I applaud you! But a lot of people are like me, I assume, because we want to be finished with work and off our feet by dinner time. Also, I put so much energy into the work I do during the day I am tired of being creative, or even making choices by dinnertime. Nonetheless, it’s the time factor that prevents healthy meals for us. I would love to eat something new and healthy every day, with less effort, and not waste food because of poor planning. Emeals is as simple as making a few choices on your phone, and then your meal plan, recipes, and grocery list are prepared for you within seconds! You can plan your week of meals in 2 minutes while sitting in the parking lot of the grocery store, and instantly have a grocery list to use inside the store! After a big “This is so easy” moment, I decided to try Emeals which is a service that sends you meal plans with recipes and the grocery list for a week at a time! And they offer a 14-day free trial which is how I started. After another “I can’t believe what a value this is” moment ($5 a month!) I knew I was on to something good. and save me valuable time. Financially, I figure many of my expenses according to what my time is worth. For example, if I make $20 an hour at my job, and decide to do something that takes me one hour to do but costs only $5, then I think I’m ahead of the game, right? It Only Costs Five Dollars A Month! I don’t know how long it takes you to make meal plans for the month and then make a grocery list but even if I spend the time to do it the chore takes an hour at the least. Even then I could forget to put something crucial to the recipe I’m cooking on the list and how frustrating is that? Did I mention the grocery list is categorized the same as the grocery store layout? I love to double my savings, don’t you? The price for the Emeals Plan is $5.00 a month! Also, if you join Swagbucks for free, you will receive an extra 15% cash back when you sign up for Emeals! Since joining Emeals will ask you to pay ahead for 6 or 12 months (after your 14-day free trial) that’s a significant amount. Swagbucks will make it easier on the wallet to join! received 10% cash back from Swagbucks. If paying ahead for 6 or 12 months is too much for you, even with using Swagbucks, you can opt for spending $10. A month for three months at a time. Remember, you probably make more than $10 an hour, so the time you save becomes well worth the cost. Also, Emeals budget meal plans. You might even save more money than you usually do at the grocery store! When you sign up for Emeals, you get the app for your phone and computer. It’s quick and easy! To me, it is worth every penny, and it gives me the chance to have healthy meals! (Find the sample week of recipes and grocery list at the bottom of this post). More examples and recipes at Emeals’ website and blog. One of the meals they offer above is on my plan (quick and healthy). The salad is yummy and since we eat a lot of Chicken Cesar salad’s we were ready for something new. The ginger in the salad is anti-inflammatory which John and I already take medicine for inflammation so from the start I was excited about this being a big part of making our health better. 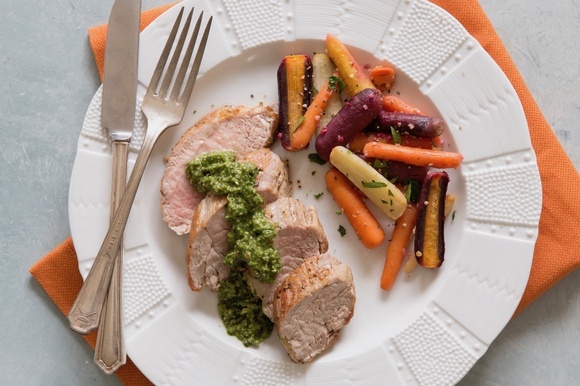 Another meal I’m excited about is this Pork Tenderloin with Kale Pesto. I love the carrots that are multiple colors! We eat pork often because the right cuts are lean and the price is also reasonable. This is a definite win for me, how about you? Beefy Pasta Skillet Dinner looks easy enough. Don’t you love those one pot meals! Less scrubbing pots and pans always appeal to me! This dish is from Emeals Budget Meals Plan. This Salmon with Honey Citrus Sauce meal has my mouth watering. I think it will be one I choose to make often. I love Brussel sprouts, and I never thought of putting balsamic vinegarette in them. The recipe is extra easy to cook. This dish doesn’t appear to be a healthy meal at first sight, but it is part of Emeal’s Quick and Healthy Meal Plan. Feel free to click on the pdf below to see a sample of my weekly meal plan and grocery list for one week. 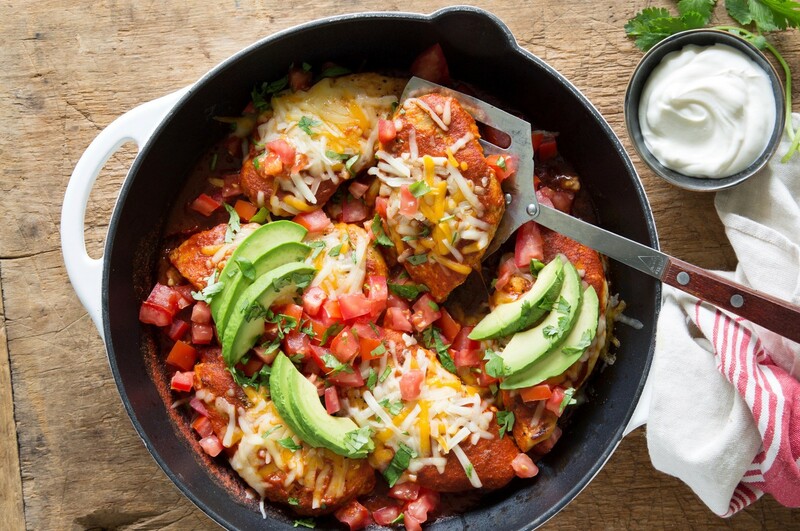 Emeals has plans for paleo, vegan, budget, low carb, quick, slow cooker, and more. 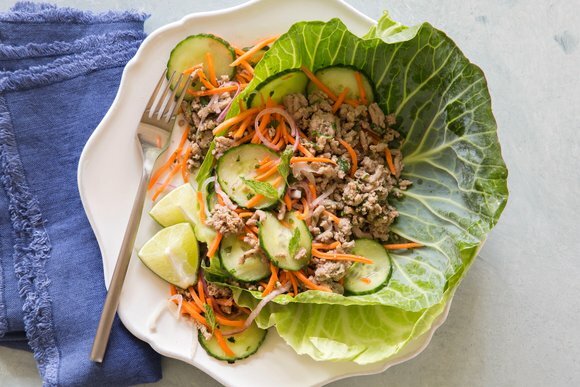 If you would like to look through the 27 different meal plan choices from Emeals click here. The grocery list has the same organization as the supermarket. This list is fantastic because there is less of a chance that you miss something on the list and it saves a ton of time. Also, there is an app for Emeals that will let you pick your meals for the week. It will automatically make up the grocery list to include everything you need. Awesome, right? Here are a few more options to save even more money. Ebates is similar to Swagbucks because it gives you a percentage back on things you usually buy. It’s free to sign up. Swagbucks gives you a percentage back on some of your purchases. Swagbucks is free to join also. Healthy IQ is a life insurance company that rewards your efforts to be healthy by giving you a discount on your rates. If you’re not sure you need life insurance, you should read this. Michelle from Making Sense of Cents has an excellent course on Affiliate Marketing and how to make money blogging. You won’t find these tips sitting on someone’s blog. They are worth it! Do you wonder if your writing sounds professional? Maybe you aren’t sure that your grammar is correct. Grammarly is an excellent program that helps you with not only spelling but all your grammar. Grammarly will show you how to fix something you’ve written that isn’t proper grammar and keeps your writing sounding professional. Tailwind is a big help in getting traffic from Pinterest. It automatically pins your Pinterest pins for at the perfect time for the best traffic to your website.